Pick Me Up is weekly women magazine to bring loads of real life stories in most interesting way. Pick Me Up is an appropriately named magazine as you would find it extremely difficult to get off it once you pick it up. Catering the need of women to be entertained with a dash of reality, the magazine has innumerous stories that may be bizarre, surprising and wild but they all have reality as a common ingredient. The tone and treatment of the magazine is very light hearted and intriguing even though the featured stories may include some sober topics of baby swapping, running away from a killer and how I lost 8 pounds etc. These stories do entertain but also educate and alerts you to be safe and extra cautious in life. The featured stories are generally posted by real people from all over the world. The proficient team of editors selects the best stories to be featured that are inspiring and enlightening. Along with the real life stories, the magazine also features other topics of women interest like beauty tips, latest fashion and money saving tips. The magazine also talks about some concerning issues like kids care and perfect diet for perfect body etc. 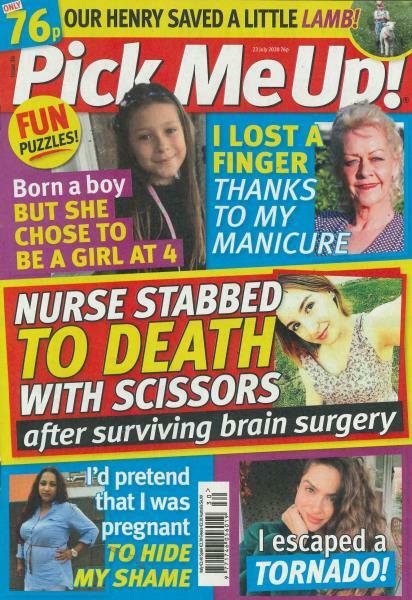 The other regular features of the Pick Me Up magazine are agony page, health SOS, mom’s club, pets and tips and advice on varied topics from home care to career. The article section of the magazine is very intriguing to provide a happy reading time. Plus the readers also get experts answers to their general health issues.